The photos in this review of are of the Dunes and Peak nines. 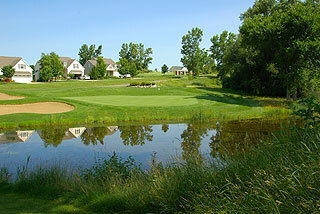 Boulder Pointe is a semi-private, non-equity golf club located in Oxford, that is always available for public play. Set amidst 1,825 acres of breathtaking scenery, this facility boasts amenities that are on par with outstanding clubs worldwide. Boulder Pointe is just beginning to receive its fair due, as it has recently been honored as one of the top public golf facilities in the state. On property are 27 holes of top quality championship golf, and comprehensive practice facilities that include a beautiful range with target areas, putting green, and a 12-hole putting course that is complimentary to guests and members. The upscale clubhouse features a full service pro shop, locker rooms and club storage services, dining area, and banquet center that can accommodate over 400 people for all sorts of special events. Their Conference Center provides 26,000 square feet of space for meetings, seminars and conferences for 30 to 400 people. Amenities on the golf course include divot repair containers and ball and club washers. 150 and 200 yard stakes are also standard on all the par fours and fives, and red, white and blue checkered flags help to indicate the daily pin placement. Special kudos go to Boulder Pointe for providing yardage plates on ALL the tee boxes - an appreciated feature we wish more clubs would adopt. Five sets of tee boxes are spread out efficiently, allowing all levels of players to choose a distance that suites them. 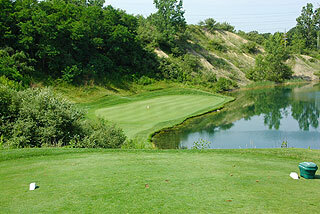 The Dunes is the longest nine, with the tips playing at 3862 yards and the forward tees measuring 2781. Alternate tee areas are arranged every 200-300 yards. The Peaks play to 3562, and the Bluffs measure 3472 from the gold tees. Don't be afraid to mix and match your tee selections on the different nines. The average golfer, playing from the white tees, may want to play the Dunes from the white tees (3145 - blues are 3339), and the Peaks (3061) and Bluffs (3024) from the blues. 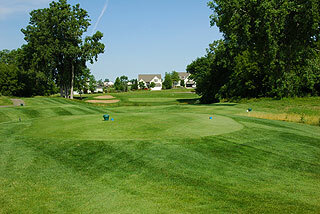 An extra set of tees allows the low handicap golfer to play the 3 nines at between 6820 and 6530. Scratch golfers will be playing at over 7000 yards with any combination of the layouts. During our review, we played the Dunes, followed by the Peaks. Hole number one on the Dunes is a snaking par five that is a welcome opening golf hole. There is no real trouble, other than high rough on both sides of the fairway. Many golfers will be able to reach in two. The second is the easiest hole of the layout - a mid length par three that is almost all carry over a marsh that sits 20 yards in front of the green. The third makes it a trio of score-able holes to open your round. From an elevated tee you will encounter an open fairway that leads to an undulating putting surface on this long par four (468 from tips, 386 from whites). Pay attention to the GPS and pin placement, as a ridge on the back third of this green will make lag putting a challenge. The fourth is another long par four that bends gently left. Aim for the 150 stake just left of the bunker on this split fairway. After 4 wide open tee shots, the fifth presents a contrast with a fairly tight tree -lined fairway. Land it on the short grass and the approach is quite easy. 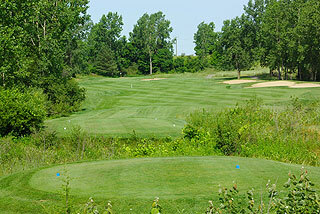 The sixth is also tree-lined and plays downhill off the tee to a green that is protected by a pond on the right side. It is best to approach from the left side here. Seven is the number one handicap and one of the prettiest holes on the course. This is the longest par four from the white tees (411 yards) made tougher by an abrupt left turn near the 150. A water hazard crosses in front of the elevated green complex, about 40 yards out. The par three eighth is all carry over a section of Stony Lake if you are going for the flag - with bail out room right an option. Aim just left of the right fairway bunker on the finishing hole of the Dunes. 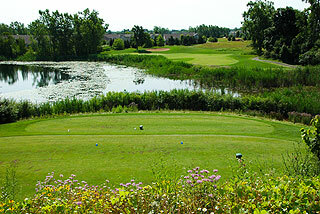 Lake Dewls runs all along the left side, though the fairway is quite wide off the tee. A narrow approach, with the hazard jutting out towards the fairway, makes trying to reach this par five in two quite a challenge. As with most of the putting surfaces on the Dunes, the undulations here appear more treacherous than they actually are. We found the greens to be very putt -able. Long hitters will love this layout, as there is much room to grip it and rip it off the tees. The Peaks Course begins with a short par four that plays slightly downhill. 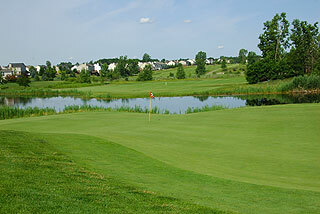 Do not be long on the approach, as a water hazard awaits just a few yards past the green. The par three 2nd is all carry over water if you are going for the flag, with considerable bail out room on the right side. This is one on many beautiful holes on the Peaks, with stone-laid walls fronting the putting surfaces. An open fairway awaits on three. This is valuable info however...on the approach the water hazard (that flanks the green on 3 sides) juts out into the fairway on the left - error right if anywhere. Aim for the right green-side bunker or lay up and play this as a 3-shot par five. The fourth tee presents a good case for playing the Peaks from the blue, green or back tees. The view from this elevated tee box, to a green fronted by water, and backed by a huge sand dune, is absolutely awesome. Check out the picture near the first paragraph of this review! This hole demands extreme accuracy, although there is some bail out room to the left that is not visible off the tee. These first four holes have formidable water hazards that make this section of the course especially beautiful. The fifth is a narrow and relatively short par four. A long iron or 5 wood is the best bet off the tee. At 584 yards, the par five 6th demands distance from the back tees, but is a relatively easy hole from the blues and whites. This is followed by a long par four that plays over 400 yards from all but the front tees. The rolling tree-lined fairway leads to an downhill approach, with little room for error past the green. It is better to be short here. The eighth is a long dogleg right par four that is tough to cut except for the longest of hitters. 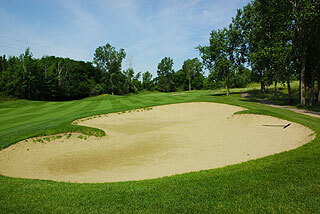 The best bet is to aim left of the fairway bunker, towards the 200-yard stake. The second shot plays 1 club uphill to a well-bunkered green. The closing hole is a short but interesting par four. Fairway traps guard the left side, and a water hazard discourages any approaches from the right. The embankment on the left side of the green is severe, and will guide any balls hit there towards the center of the green. In contrast to the Dunes, the Peaks is considerably shorter, with more hazards to deal with. Both of these nines are fine layouts, with wonderful conditioning from tee to green. With slope ratings from 122 to 142, and 5 sets of tees, Boulder Pointe presents a lot of options. Choose the correct tees for your game and you should be able to score your handicap. 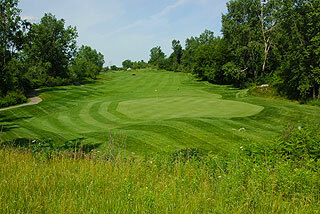 This is a very fair and playable course, that is also extremely interesting and fun to play. he Bluffs nine at Boulder Pointe uniquely features wide fairways that are defined by tall grasses, which not only make the layout more challenging, but also add to the color and aesthetic beauty. The conditioning and amenities of this nine matches that of the rest of the course - pretty darn perfect. With 27 holes of beautiful championship golf available, players will experience a variety in design and shot selections not very often seen on metro area courses. .